The Romans then retraced their course up the Tigris. Whether on water against the current, or on land, this return progress would have been slower than the exhilarating trip down the river to the Gulf. Trajan deliberately paused at the ancient ruins of Babylon, 55 miles (88 kilometers) south of today’s Baghdad. Babylon’s original culture had been more than 1,500 years old when Alexander the Great died here during his great eastern campaign of conquest. At Babylon, Trajan was shown the room where Alexander had reputedly breathed his last, and there he conducted a religious sacrifice in memory of the great Macedonian king. As he lingered at Babylon, Trajan received unsettling news. While he had been playing tourist and sailing down to the Gulf and returning again, “all the conquered districts were thrown into turmoil and revolted, and the garrisons placed among the various peoples were either expelled or slain.” [Ibid.] Nisibis and Edessa were among the cities that had revolted, as had Seleucia, only a comparatively short distance from Babylon. In response, Trajan quickly sent his best generals, Quietus the Moor and Maximus, hurrying north with flying columns, and dispatched a force under legion commanders Ericius Clarens and Julius Alexander to retake Seleucia, a city with a population of as many as 600,000 people. Maximus’ troops were engaged in battle in the field by the Parthians. The Romans were defeated, the loyal Maximus slaughtered in the fighting. 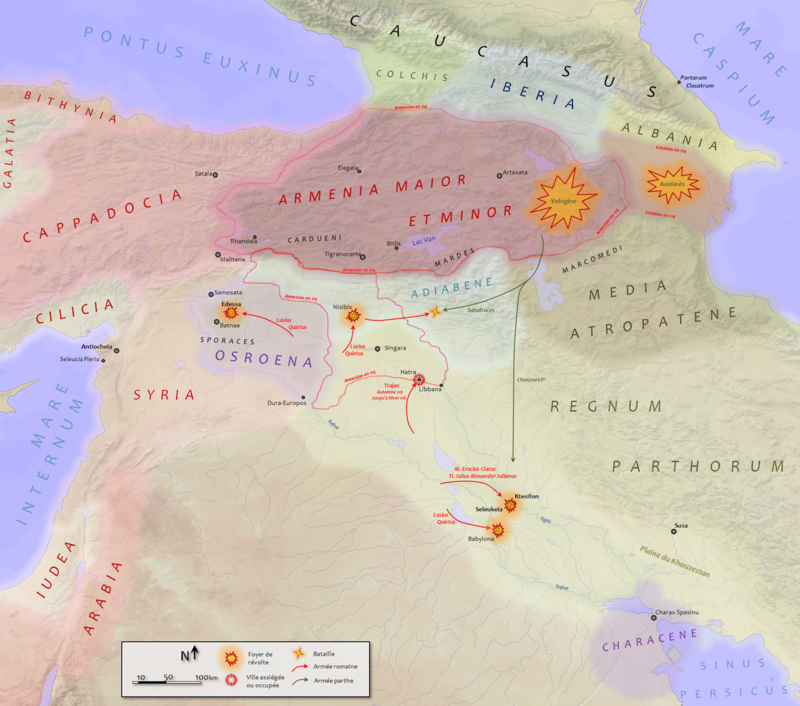 Lusius Quietus made up for Maximus’ failure by recovering several key cities including Nisibis and storming a stubbornly defended Edessa, which his troops sacked and left in flames. Seleucia was also recaptured, by Clarens and Alexander, and it too was put to the torch after being sacked, although it appears not to have been totally destroyed. Trajan himself returned to Ctesiphon, the Parthian capital, and on the plain outside the city he called an assembly of his troops and of all Parthians in the vicinity. Trajan, after mounting a lofty platform in front of the assembly, told his audience of all he had achieved in this war, and announced that he had chosen a new king of Parthia—it would be, he said, Parthamaspates, a Parthian prince, whom he now produced and crowned king. Parthamaspates was left at Ctesiphon to rule over the Parthians while vowing fealty to Trajan and Rome. Trajan, in the meantime, led his troops north to Hatra, a little west of the Tigris, where the Atreni Arab residents had also revolted and closed their gates to Romans. The city of Hatra was not large, and it sat on the edge of the desert with little water and no trees in the vicinity. But these very qualities made it difficult to besiege. 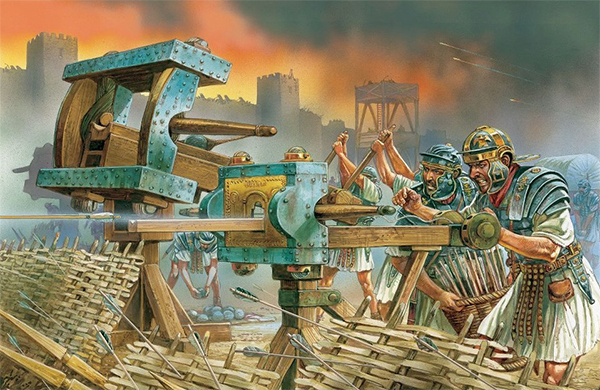 Trajan had a camp built, and surrounded the city, then sent his legionaries against its walls with mining equipment. As the siege of Hatra dragged on, the Roman besiegers were sometimes drenched with rain and pelted by hail, while at other times they endured fierce heat and were plagued by flies that settled in masses on their food and drink. With the siege making no progress, the morale of his troops drooping and the campaigning season nearing its end, Trajan gave up his attempt to take Hatra, and ordered his troops to pack up and pull out. As the army marched north, Trajan began to feel increasingly unwell. The year had seen the legions and auxiliary units involved in the campaign suffer heavy casualties. With supplies low, Trajan, now sick and exhausted, withdrew his forces from Mesopotamia. Leaving his army in Armenia and Cappadocia for the winter, he returned to Antioch, where he rejoined his wife and nephew, who had been supervising the metropolitan rebuilding efforts in the wake of the earlier earthquake. Now, all thoughts of resumed operations in Mesopotamia were forgotten as Trajan set out to eliminate the Jewish problem. The Jews of Judea, however, had not risen with their compatriots elsewhere in the East, so to ensure that Judea remained secure Trajan detached the 6th Ferrata Legion from his army and stationed it at Caparcotna in Galilee, just 15 miles (24 kilometers) from Nazareth, in the heart of Jewish territory. Simultaneously, Trajan gave Lusius Quietus, fleet prefect Turbo and his other senior commanders orders to take more troops from his army and put down the Jewish rebellions elsewhere. Units quickly set off for Egypt and Cyrenaica to the south, and, by sea, for Cyprus to the west. Meanwhile, to consolidate the Roman hold on Armenia, Trajan sent the 16th Flavia Legion to the city of Samosata, in southwestern Armenia, to establish a new base there, with the 15th Apollinaris Legion making the 16th Flavia’s former base at Satala its new home. By the middle of the summer, with his poor health sorely affecting him, Trajan decided, or was convinced by those around him, to go home to Rome. In late July, he set sail for Italy with Plotina, leaving Hadrian at Antioch still in charge of Syria. Tracing the Turkish coast, the emperor’s flotilla put in at Selinus in the province of Cilicia, today’s Anatolia region in southern Turkey. There in early August AD 117, shortly after his arrival, Trajan apparently suffered another stroke, and died. So it was that after almost twenty years on the throne, and with his Parthian expedition up in the air, Trajan left the scene. In a letter signed by his wife but supposedly from Trajan, 41-year-old Hadrian was named as his heir. As a result, Hadrian was proclaimed the new emperor of Rome by the legions in the East, and this was subsequently endorsed by the Senate. In the end, apart from glory for Trajan and booty aplenty for those of his troops who survived the campaign, Trajan’s Parthian War achieved nothing, at considerable cost. Many thousands of legionaries and auxiliaries perished in the campaign, and, while numerous cities and towns had been briefly occupied or destroyed, no new territory or sources of income had been acquired by Rome. The Parthians, meanwhile, rejected and ejected Trajan’s choice for king, Parthamaspates, and appointed a new ruler of their own choice. As for the balance of power in the region, it was left unchanged. 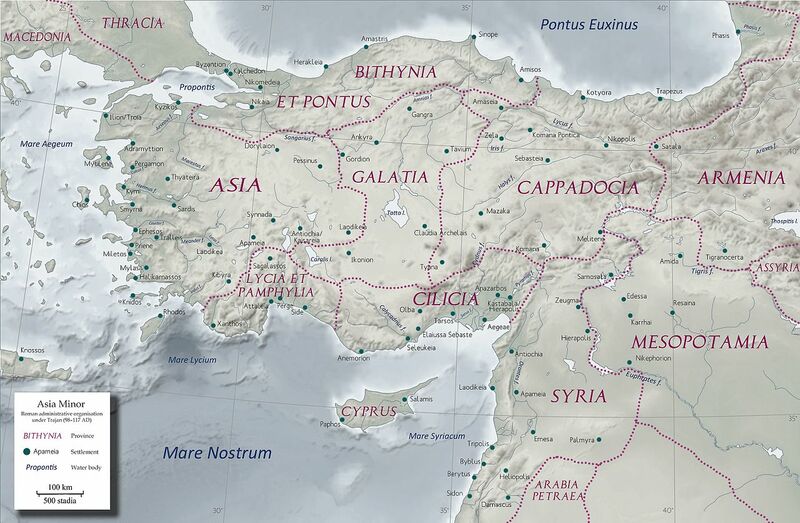 The Euphrates continued to serve as the boundary between the Roman world and the Parthian world. And the Parthians rebuilt their power in the region, to the extent that they would be in a position to invade Syria before half a century had passed. Hadrian set off for Italy, making a leisurely perambulation through the eastern provinces. By the summer of AD 118 he had arrived in Rome. With no intention of following in Trajan’s expansionist footsteps, Hadrian officially terminated the campaign in the East and sent the 1st Adiutrix Legion back to its longtime Danube base in Moesia. Hadrian’s self-appointed task from this point on would be consolidation of the frontier throughout the empire. Before the year was out, several of Trajan’s leading advisers and generals were arrested on what were probably trumped-up charges of conspiracy against Hadrian, and executed. Among the generals who perished in this pogrom were Palma, who had annexed Arabia Petraea for Trajan, and Quietus, the Moor who had proved to be Trajan’s most reliable and effective field commander in Dacia and the East. As Hadrian removed Trajan men from power and put his own stamp on the Palatium, even Trajan’s brilliant but arrogant architect Apollodorus of Damascus was sidelined, and eventually executed, by the new emperor. Hadrian went as far as removing the superstructure of Apollodorus’ famed bridge over the Danube, leaving just the massive piers standing. Hadrian’s excuse for this act was a fear of barbarian invaders using the bridge to cross the river into Roman territory. Some writers have suggested he may merely have been so jealous of Apollodorus he wanted to destroy one of the greatest monuments to his genius. Under Hadrian, Rome now moved from the financially unsustainable offensive stance taken by Trajan in both the West and the East, to one of defense. From this time on, the Roman Empire would be forever on the defensive.